The holiday season had clearly taken hold of Philadelphia, and Martha was forced to swerved between more people than she had ever seen on South Street before. She passed Repo Records and finally swerved left to get off of the main street and head down to Bainbridge for a while. The relief allowed her to slow her pace and take in the sights of a road less traveled during her usual holiday shopping routine. She passed a junk store she’d never seen before and out of the corner of her eye spotted something that made her stop dead on the sidewalk, leading a homeless man to bump into her. He excused himself and continued around her as she turned to look in the giant window filled with vintage holiday objects. She scanned the display, past a plastic wreath that had seen better days, ignoring a small set of Rudolph salt and pepper shakers to a shelf that was eye level. 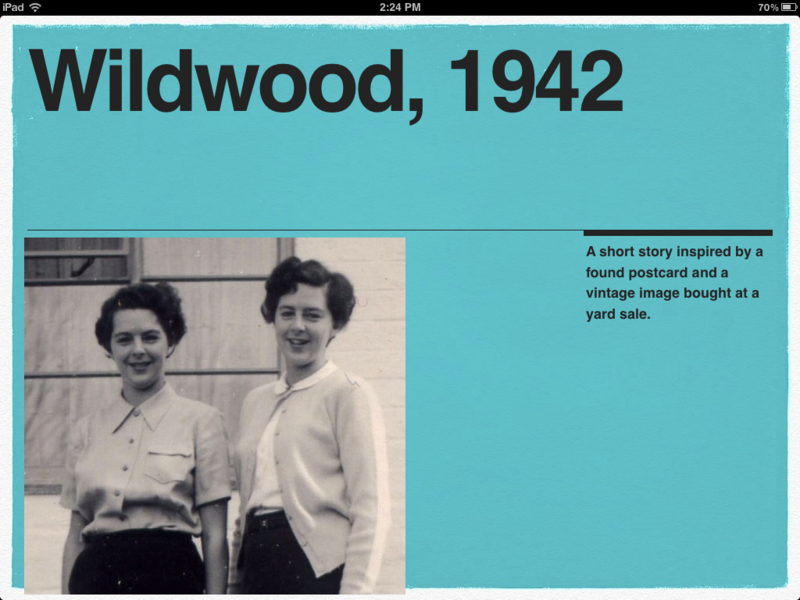 There they stood, and she instantly flashed back to childhood at her grandparents’ home in the suburbs. Santa Claus, hands behind his back, leaning in for a kiss. 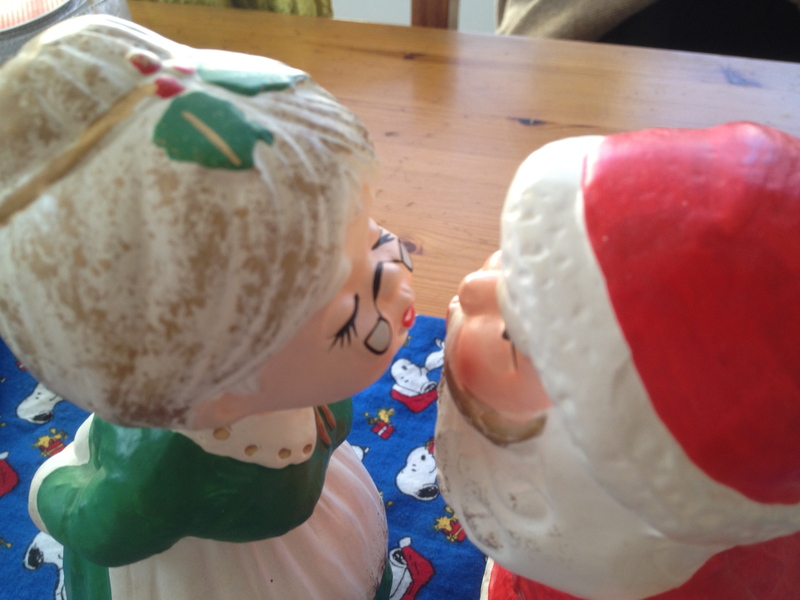 Mrs. Claus, hands also withdrawn, leaning in for the same kiss, standing on a little pedestal that Martha knew would make Santa’s wife spin and play a cute little holiday song similar to those that came from children’s jewelry boxes. Martha turned and entered the store, opening the door a little too boisterously, causing the bell attached to the top to ring with more violence than it should. She could practically hear her grandmother tell her to be careful as she reached for one of the statues. 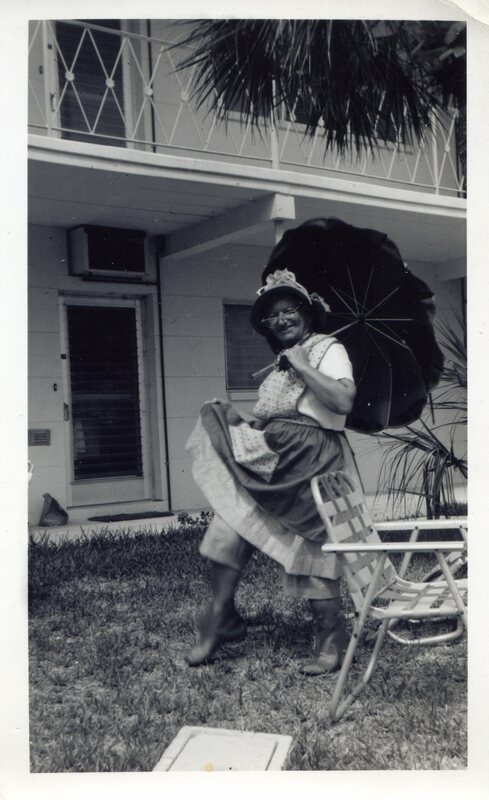 The man at the counter, old and frail beyond his years, looked up at her over his wire-rim reading glasses. He smiled and approached her, fixing his aged suspenders as he walked. “Interested in the kissing Santa and Mrs. Claus, young lady?” She nodded and put a hand out to take the statue of Mrs. Claus. She thought back to Christmases past and could practically smell the spaghetti sauce cooking in her grandmother’s kitchen. She could see the chestnuts roasting in the fireplace, her grandfather worriedly checking them every few minutes. Even the old marble table where the two statues sat year after year came into view for Martha. And then she remembered what happened to the set. Her little sister was playing with them, winding up Mrs. Claus, when the tragic event took place. A stumble, a fumble and Mrs. Claus’ severed head rolled up to Martha’s left foot. A frantic aunt sneaking the statue away and quickly playing doctor with quick dry rubber cement, and it was almost like it never happened. But Martha could tell; she could spot the spider web crack in the statue’s neck in an instant, maybe just because she knew it was there. “Young lady, are you okay?” the man asked her, waking her up from the memory. She shook her head. “I’m fine. 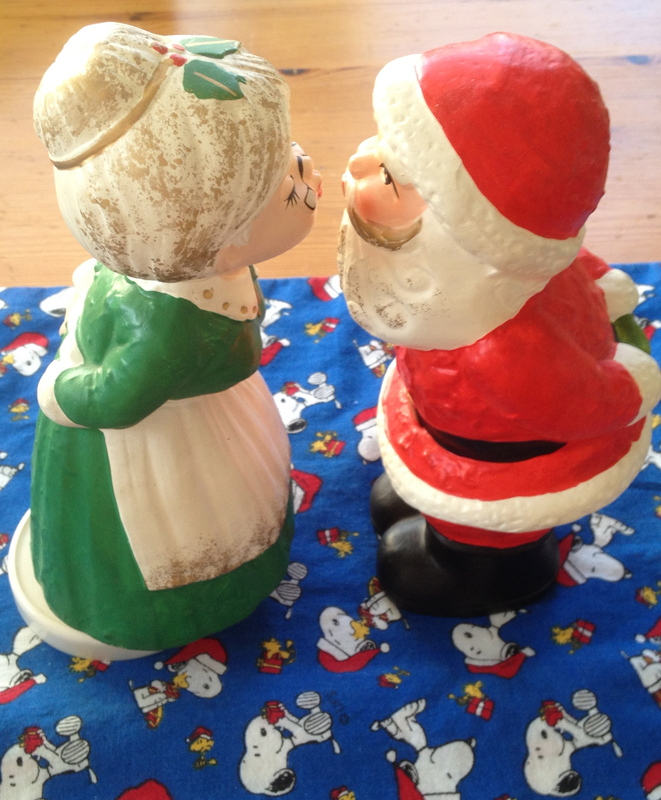 I would love to purchase this.” As she turned the statue, examining Mrs. Claus’ white apron, her green dress and the puckered lips, she noticed a tiny crack in the neck. “But…” she looked at him, confused. “Yup!” he said with a triumphant smile. He slouched a little as her mother walked up. “He’s only eight,” she whispered into her daughter’s ear. This is part of my ongoing project of flash fiction typed onto vintage photographs using an antique typewriter. If you’d like to see more keep looking here or visit my Etsy.